Prodded by the German chancellor, the big rich nations’ leaders have pledged to get rid of all fossil fuels by 2100. But at home, her party has joined the unions in fighting a crackdown on heavily polluting lignite. Merkel risks undermining her credibility – and the G7 deal. German Chancellor Angela Merkel gives a speech during the Petersberg Climate Dialogue conference in Berlin, Germany, May 19, 2015. Leaders of the world’s major industrial democracies resolved on June 8 to wean their economies off carbon fuels, marking a major step in the battle against global warming that raises the chances of a United Nation’s climate deal later this year. 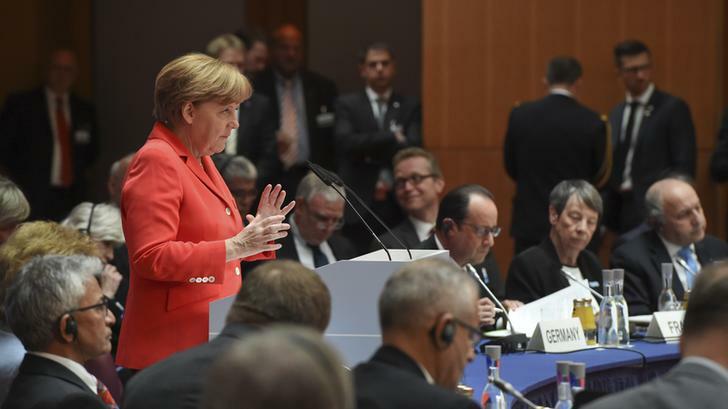 The Group of Seven’s energy pledge capped a successful summit for host Angela Merkel, the German chancellor. The G7 leaders pledged in a communiqué after their two-day meeting to develop long-term, low-carbon strategies and abandon fossil fuels by the end of the century. “We commit to doing our part to achieve a low-carbon global economy in the long-term, including developing and deploying innovative technologies striving for a transformation of the energy sectors by 2050,” the communiqué read.